This 10G SFP+ cable delivers what you need most in your network connections: reliable performance. Itâ€™s built to MSA specifications and fully tested to ensure seamless compatibility. This passive twinaxial cable is a fully hot-pluggable, direct-attach cable, supporting 10 Gigabit Ethernet applications connected through SFP+ (Small Form-Factor Pluggable) ports. Designed for high-speed interconnects, this low-power, low-latency Twinax cable is a cost-effective alternative to fiber-optic cable assemblies, supporting applications such as point-to-point in-rack and across-rack network switch or server connections. 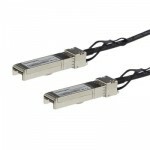 Backed by a StarTech.com 2-year warranty, the SFPH10GBCU6M is a reliable extended 6-meter replacement cable for the Cisco SFP-H10GB-CU1-5M.